Bosque de Los Aluxes is one of Playa del Carmen's newest luxury condominium facilities. 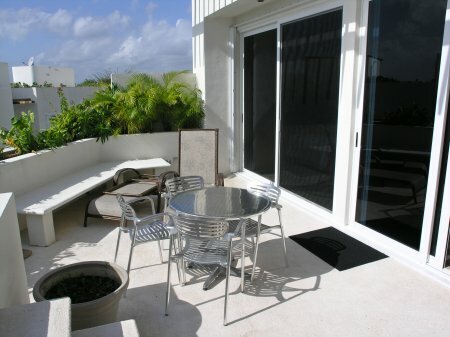 It has a convenient location on 5th Ave at 34th Street in the popular North End of Playa del Carmen. This is a quieter section of 5th Avenue and yet it's just a 5 minute walk to North Playa del Carmen beach near Shangri-La Caribe, or the cafes, restaurants and shops in the "Little Italy" section of Playa which are just south of Bosque de Los Aluxes. This Bosque de Los Aluxes building of modern architecture, and pure lines, respecting nature and mingling with the environment through the use of traditional materials thus minimizing the impact. The building was designed with some basic premises in rnind: spacious units, privacy, views of each unit, and a direct connection between balconies and the living room in each unit. The building is made up of three levels connected in the first floor by the El Callejon de los Suenos, a commericial area, that is actually a continuation of the 5th Avenue. The total built surface area is of 54000 sq.ft, combining the units with very well adapted open areas. The 16 units are organized in three different types: duplex apartments with three or four bedrooms, duplex apartments, with two bedrooms,of about 970 sq.ft, to 2100 sq.ft. plus deck. El Callejón de los Sueños leads to the general entrance.The building has two circular elevator shafts strategically located in order to connect every unit, wich can be accessed from the parking areas in the first floor. To view the property or for information contact us at www.american-development.com. All of these in Playa del Carmen vacation rentals are equipped with the most advanced facilities, visitors and guests a comfortable accommodation and friendly service in Playa del Carmen Vacation Rentals staff visitors a memorable stay. This is why tourists like Playa del Carmen travel, and would like to visit this place again and again.